SMART Interactive Whiteboards are innovative technology based on the idea of conventional whiteboards that have been around since long. They look just like normal whiteboards but they can be connected to computer systems and people can collaborate over them via state of the art touch technology. 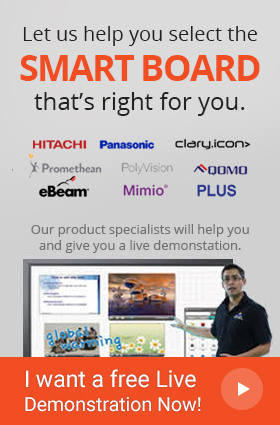 SMART Interactive Whiteboards are one of the best devices that the collaboration industry has to offer. Multiple people can interact on it at the same time, from different locations, and different platforms, which is not something to be found in other collaborative tools available in markets. Their ability to be connected to a computer system means that collaboration is not limited to handwritten notes, but virtually any kind of material; including pictures, documents, and web pages; can be browsed either from the connected computer system or the internet. SMART offers intuitive annotation tools with its interactive whiteboards which users can utilize in brainstorming sessions. Most SMART Interactive Whiteboards also come installed with the SMART Learning Suite that has educational applications and helps teachers build an interactive learning environment in classrooms. SMART Interactive Whiteboards are ideal for organizations that aim to excel through collaboration. Conference rooms, classrooms, marketers, artists can all benefit from their multitude of features.